Hey Jim,That's an Impressive shot of that stove in action,& You have set-up Your site,Very Well Indeed! Thanks, Rich. Blogger makes it pretty easy to look good. I've benefited greatly from the discussions on this web site, and my posts on my blog reflect that benefit. Another great review, thanks Jim. Could you possibly include a couple of camp site photos next time? Always nice to see some new scenery. Thanks. All of the stoves are photographed in the field, which takes some time, and then of course I have to upload and assemble the photos AND write the text. I'll include site photos when I can, but time sometimes grows short. 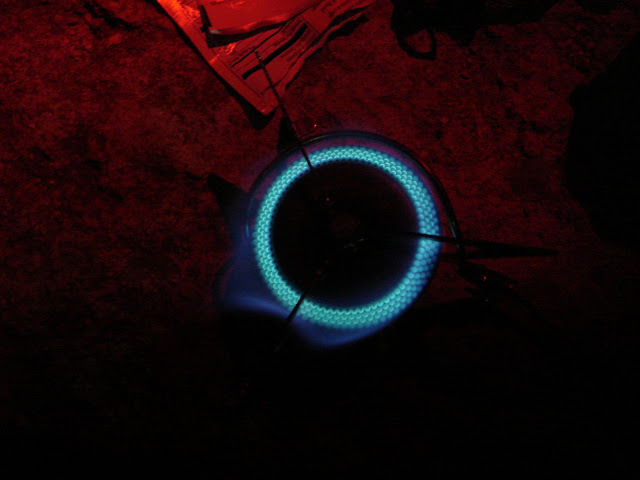 My favorite posts are where I walk you through a trip in travel log fashion AND review a stove, and I'll do those when I can. My SOTW post on the Primus Omnifuel will be coming up in a few weeks, and it will be written in just that style. Next up: The Borde stove. Stay tuned. I quite like the Borde form the looks of it, compact and liquid fueled. Too bad they are really expensive from what I can see. You're not that far off. lol. Generated in 0.038 seconds in which 0.009 seconds were spent on a total of 15 queries. Zlib compression enabled.